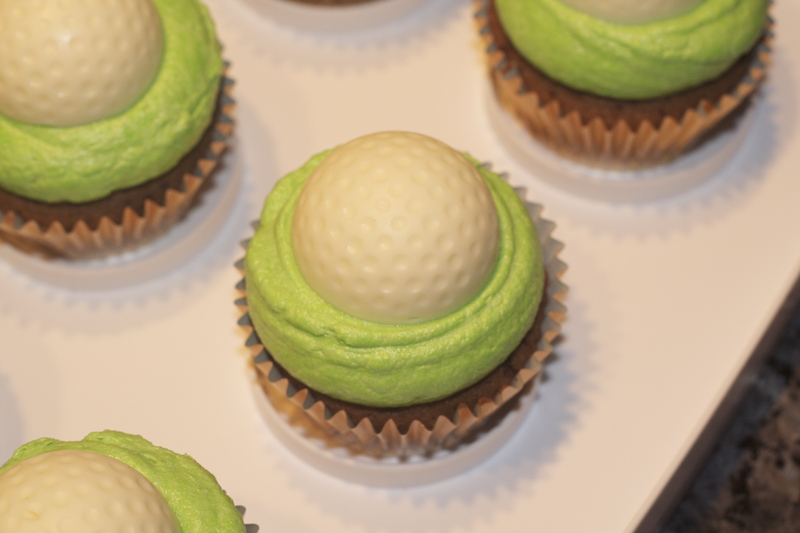 An old golf ball ice mold was the inspiration for these Father’s Day cupcakes. 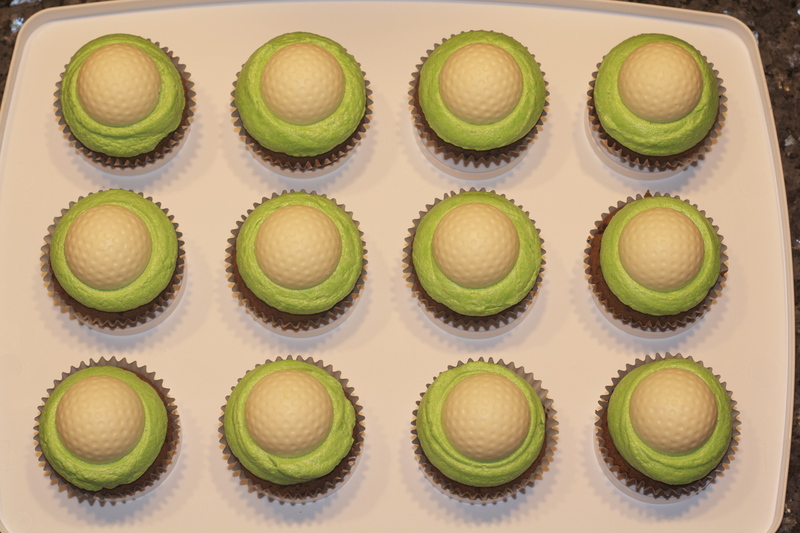 I knew I wanted to go with a golf theme, so it only seemed natural to incorporate the ice mold into my cupcakes. As far as the recipe goes, it is kind of a mix of recipes that I have picked up here and there. 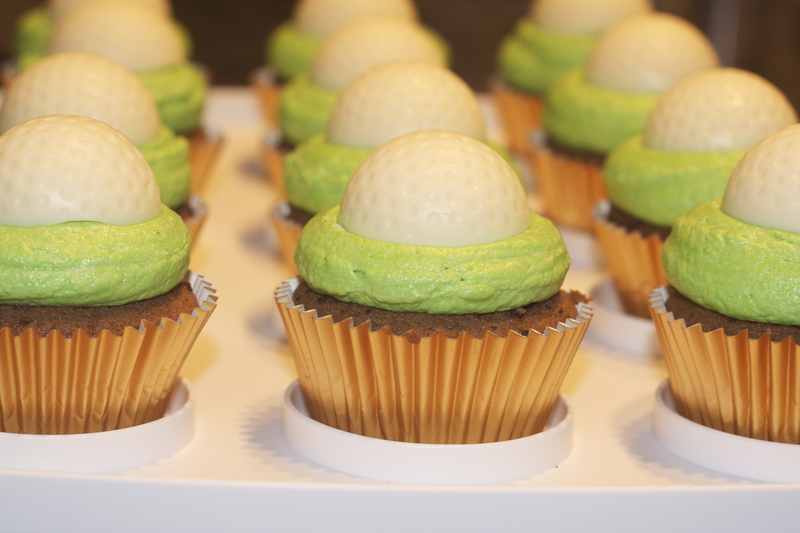 Nonetheless, these chocolate cupcakes, filled with peanut butter, topped with green buttercream, and a white chocolate golf ball were at hit at Father’s Day dinner! Preheat oven to 375 F. Do not use the fan. Place the dark unsweetened cocoa powder in a small heat prof bowl. Add the milk and then the hot boiling water. Mix well and set aside until it has reached room temperature. In a bowl mix together flour and baking powder with a whisk and set aside. In another bowl cream butter, salt, sugar and vanilla extract well, using your hand or kitchen mixer. Add the eggs, one at a time and mix well in between. Scrape down the sides of the bowl and sift in the flour mixture. While mixing in the flour, pour in the cocoa mixture. Mix until its all smooth. Fill the cupcake paper cases 3/4 full with the chocolate batter and bake the cupcakes in the middle of the oven for about 20 minutes. Remember to check with a cake tester/toothpick to see if the cupcakes are done. Transfer the cupcakes from the pan to a cooling rack and let them cool completely. For frosting, in the bowl of an electric stand mixer, using the paddle or whisk attachment whip butter on medium high speed (if using whisk attachment whip on high speed) until nearly white and very fluffy, about 7 – 8 minutes, frequently scrapping down the sides of the bowl. Add in powdered sugar, heavy cream and vanilla extract and mix on low speed until blended, then increase speed to medium and beat until very light and fluffy, about 5 – 6 minutes, frequently scraping down the sides of the bowl. Add green food coloring and mix until combined. Transfer frosting to piping bag with Wilton 1A tip, set aside. Scoop out centers of cupcakes and fill with peanut butter. Frost each cupcake with generous swirl of frosting. Set cupcakes aside. 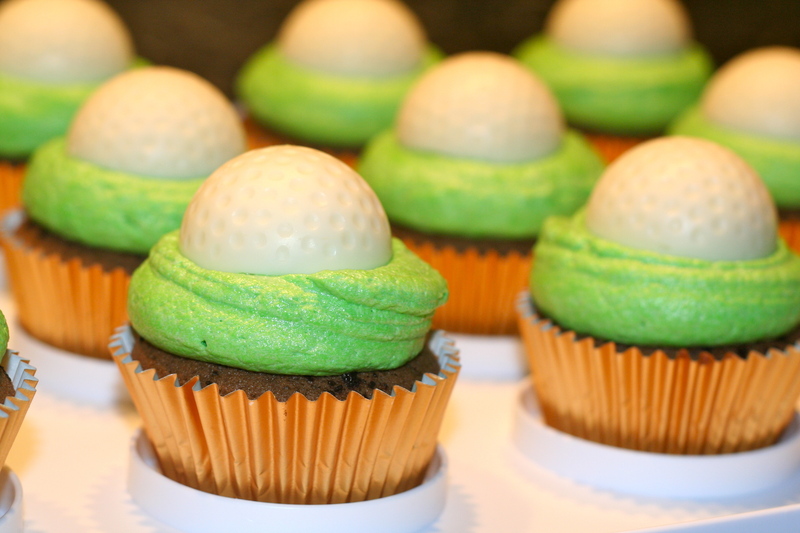 For the golf ball toppings, melt Wilton melting chocolate in microwave. 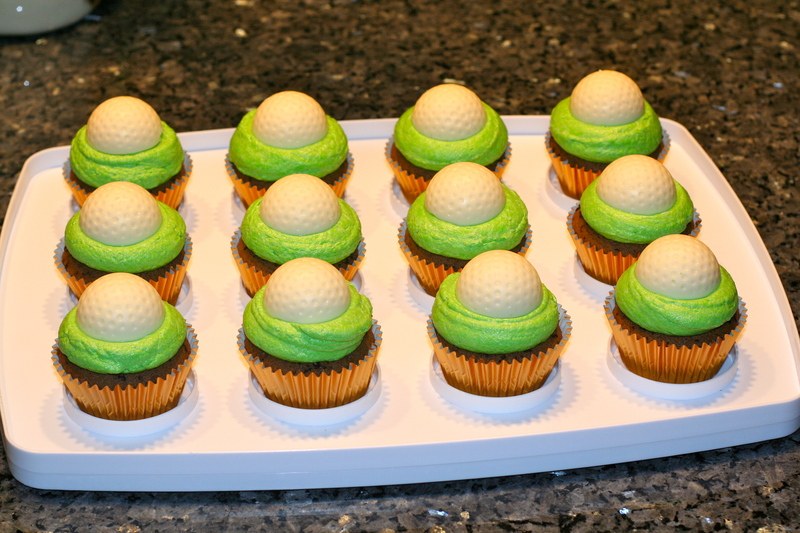 Fill golfball mold with melted chocolate and transfer to freezer. 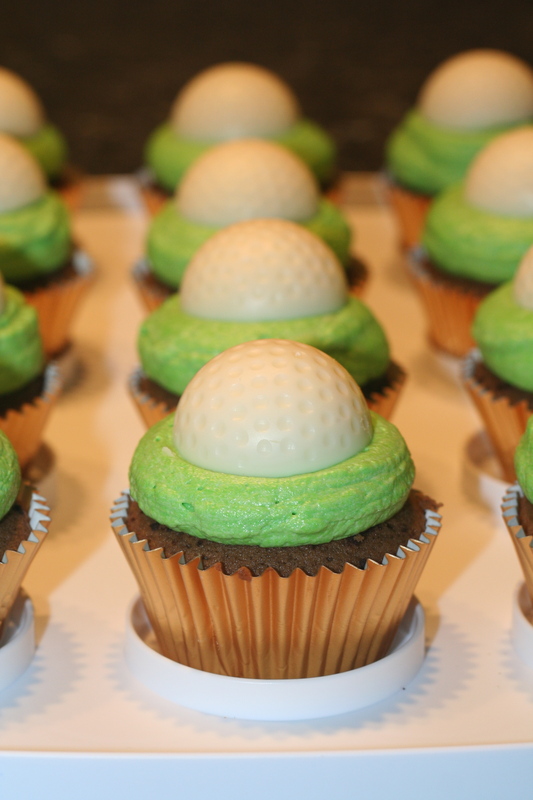 Once frozen, remove golf balls from mold and place one on each cupcake. I love these! The golf balls are so cute! I’ll have to remember this for the hubster’s bday. Thanks for posting! a nutrient. Some of the more common indicators that you might have trouble with your foundation include:.